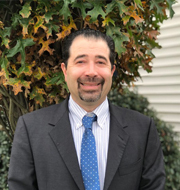 David LaGattuta graduated with a Bachelor of Science from the University of Scranton in 1996David received his Master's in Arts in Audiology from The College of New Jersey in 1998. He completed his Doctorate in Audiology during 2011 at A.T. Still University. Mr. LaGattuta has his Certificate of Clinical Competency from the American Speech Language and Hearing Association. He is a fellow of the Pennsylvania Academy of Audiology. David started working at Bucks ENT during January of 2014. He has been working for the Crozer-Keystone Health System at Delaware County Memorial Hospital and the Springfield Hospital for Dizziness and Balance since 1999. His areas of expertise include vestibular and balance assessment, pediatric assessment and tinnitus management. David grew up in Queens, New York and has been living in the Philadelphia Metropolitan area since 1999.